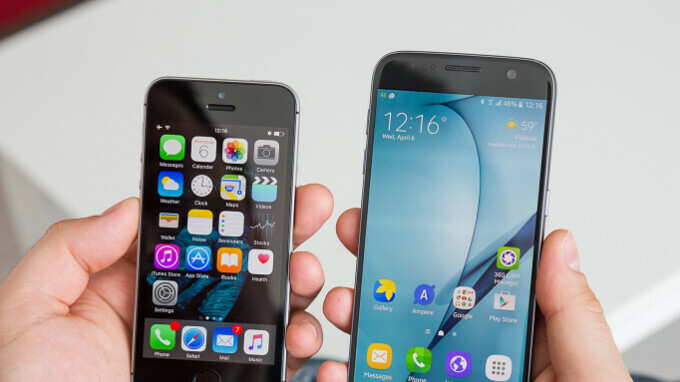 Apple's iPhone SE (pictured above on the left) will soon be 2 years old, and yet it's still a pretty popular handset, being the only 4-inch smartphone that offers nice features in a premium body - all at a decent price. Recently, we've heard rumors about a next-generation iPhone SE, possibly called iPhone SE 2, which could be released before mid-2018 to cater to the needs of users who aren't crazy about large screens. But a new report now has it that Apple might not be working on an iPhone SE 2, or at least not yet. According to MacRumors, well-connected KGI Securities analyst Ming-Chi Kuo says it's unlikely for Apple to "have enough spare resources to develop a new iPhone model for launch" in the first half of this year. That's because, apparently, Apple wants to make sure that its fall 2018 iPhone line-up (likely including 3 new large devices) is released on time. Last year, Apple announced the iPhone 8, 8 Plus, and iPhone X on the same day, but couldn't launch them at the same time, with the iPhone X hitting the market 6 weeks after the iPhone 8 series. This may not have been great for business, so it's understandable why Apple would want to use all its resources to avoid repeating this mistake. If and when a next-generation iPhone SE arrives, Ming-Chi Kuo doesn't expect it to bring too many novelties. While the handset should have a more powerful processor compared to the original iPhone SE (possibly the Apple A10 Fusion found inside the iPhone 7 series), it may not offer stuff like Face ID or wireless charging. Of course, for now, we really can't be sure of Apple's plans regarding the iPhone SE 2. Nevertheless, if you're waiting for such a handset, you should probably not hold your breath for it to arrive in the near future. Apple and disappoint have lately been going hand in hand. No sense in continually whining about it though, the Galaxy S9+ will become my daily driver until the Note 9. Here’s hoping 2019 will see Apple going back to delivering awesome products. Mate they should improve their software first.. iOS very bad system now!! Lags, bugs and no features.. I'm not a fan of this :( Hopefully it doesn't come to pass. I would give a lot for a SE2. Look for the price it's not worth it. People have shown that with their buying power. They didn't buy as many as expected or needed to make another version. That is why there is still a ton of BOGO deals for them. Some even give you buy one get one free with a gift card. That should tell you why they are not making another version right now. True, but to give a gift card and a free iPhone as well. I haven't seen that too many of those combos. I hope that they make iphone SE2 eventually Maybe next summer three phones, with the SE2 between them. No I’m waiting for iphone se x.
I use the SE as my daily driver and didn't pay that much for it either. I have several friends that use it also. I prefer a smaller screen as I can do everything with just my thumb. Would love a new SE2. SE2 and Xs plus please! Hopefully another true one handed phone doesn’t bite the dust. Aside from the SE, I think the 6/7/8 is s good size for one handed, but looking at rumors seems all models this year are getting bigger. That's true, so long as there is demand for the non-plus models, I would see no reason to discontinue them. One-handed functionality is still ideal for some and given the specs are very similar, they won't consider the plus either. If the rumours are true, this could piss people off lol. Larger phones are good for multimedia usage but can be annoying for every day tasks, I know a lot of my friends who got annoyed with my note8. I’ve upgraded from iPhone 5s to iPhone 8 Plus. I love my new phone but I think the big screen is a lot of hype. I would have bought an iPhone SE if the design was different than that of iPhone 5s, it was waterproof and had the same performance like the 8 plus. It seems to me that Apple treats the SE like the second rate iPhone. It would be nice to have a small iPhone with all the latest technology and features like the bigger ones. Apple need an SE replacement before the current SE cant support the latest iOS. If there isnt a cheap alternative businesses will likely look to other alternatives which would be Android. Even the cheapest Android phones nowadays have 5-inch screens, minimum. There is nothing left that competes with a 4-inch iPhone SE. Sony's compact versions of their high end smartphones are smaller than the average cheap Android phone, but even they are larger than the SE, tending to be closer to the size of, say, an iPhone 6/6s/7/8 with a 4.7-inch screen. There is almost nothing left to compete with the SE, and as has been noted, it is not as popular as the rest of Apple's lineup, and so while I like the design and smallness of the SE, I kind of doubt they will end up releasing a replacement, especially after the news came out that Apple will be changing its 2018 plans in order to re-center itself. SE 2 is probably the first thing that got bumped out of the way in all of that. As a business, the bean counters care whether a device is fit for purpose but they're not that bothered about fit for use. If you have 10000 employees and you need to supply each one with a phone, then you'd go for the iPhone SE at £250 rather than the iPhone 8 at £750 because it'll cost you £2.5m instead of £7.5m. They don't care whether you, as an employee, prefer a bigger screen. If Apple drop the SE and the only other alternative is something like the iPhone 7 at £500 you're still doubling your costs when it comes to upgrading. Yes, and that is also a reason for Apple to dump the iPhone SE, because it brings down their average selling price per unit, and also their profit margin when compared to other iPhones. Apple would rather force the bean counters to buy up. I'd be happy with an SE, but Apple really wants me to buy an iPhone 8 or better (which I will not do because I don't currently have the money). That said, I will start my first out-of-college job on Monday. I am super-stoked, and I will probably not be around as much because of that... just know that I will be happily employed and busy during the work week from now on!